Take 81 S to Exit 138 MacAdoo/Tamaqua Rt 309. Follow signs for Tamaqua south. Stay on 309 S in to Tamaqua then turn left at 209 (Downtown Tamaqua) follow 209 for about 2.5 miles into Coaldale. Turn right onto 1st St. Look for Blue Cupolas about 2 blocks. The church is on Left. Take 81 N to Exit 138 MacAdoo/Tamaqua Rt 309. Follow signs for Tamaqua south. Stay on 309 S into Tamaqua then turn left at 209 (Downtown Tamaqua) follow 209 for about 2.5 miles into Coaldale. Turn right onto 1st St. Look for Blue Cupolas about 2 blocks. The church is on the left. Take 309 NW to Tamaqua. At center of town turn right onto 209. Follow 209 for about 2.5 miles into Coaldale. Turn right onto 1st St. Look for Blue Cupolas about 2 blocks. The church is on the left. Follow 80 to 81 (see above) or 76 to 81 (see above). For a complete list of upcoming services, please visit the parish’s website. 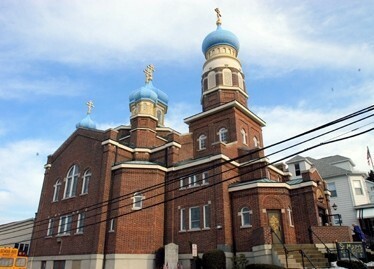 The history of St. Mary Orthodox Church in Coaldale, Pennsylvania, really begins in the memorable year of 1909 through the zealous efforts of Professor Elias G. Boruch, Theodore Pluta, and other Orthodox layman ably guided by Archpriest Micheal Fekula of St. Clair, PA. However this event begins only a small fragment of a greater history of the Orthodox Church, which, of necessity, began with the day of Pentecost, when the Church of Christ was founded. Therefore, the life of each individual who participated in the founding of St. Mary—for that matter, of any Orthodox church—was influenced and conditioned by the history of 2000 years’ duration of the Orthodox church. The thought of having an Orhtodox church in Coaldale existed latenly in the minds of many, but in 1909, after an initial meeting, a request was sent to His Eminence, Archbishop Platon, to accept the organization into the fold of the Holy Orthodox Church. After consideration the Archbishop directed Archpriest Alexander Hotovitsky to begin the task of organizing the parish which consisted of Russians, Galician-Russians and Ugors who transfered from the Uniate church. The first Divine Liturgy was celebrated on Sunday, September 26th, with Fr. Hotovitsky and Fr. Micheal Fekula concelebrating together in the English Public school on Philips St. in Coaldale. Following the Liturgy the first meeting of 200 members was held. On October 11, 1909, the Charter was signed and recorded at the Schuykill County Courthouse in Pottsville, Pennylvania. Through his self-sacrifice and zeal, Father Fekula, together with his dedicated parishioners, established the ground work. By the Grace of God and sheer will power, the untiring work of the gospel had begun. Over the years almost 20 different priests have served the faithful of St. Mary and as the landscape has changed the parishioners of St. Mary have stayed true to the Holy Orthodox faith. Today St. Mary Church continues to be a light set on a hill for all to see, and we pray that the Theotokos and the Lord Himself will continue to bless this community as we continue to bring the message of the Gospel to those who will listen.